Roof trusses combine rafters and attic floor joists into a modular triangular unit that replaces the traditional roof framing method. In traditional framing the roof is built stick by stick. With trusses it is possible to prefabricate the pieces needed into modular frames that can be installed every 24 inches to frame a roof with much less time and trouble. The connection between the trusses and the wall top plate is essential to the strength of your new roof. Most building codes require hurricane tie brackets to attach the truss in place to secure it against high winds. Although not always required, best practice and simplicity make them a necessity. Trusses serve as a modular skeleton for your roof. Measure and mark the top plate of the walls on either side of your structure, running in line with the proposed roof's ridge every 24 inches. Start from the same end on both walls, so that the sets of marks are parallel. Stand the first truss on the end of the wall, flush with the outside end of the wall. Center the truss side to side so that the ends overhang evenly on each side. Nail through the bottom horizontal board of the truss on an angle into the top plate on each wall to hold it in place. Position a level on the rafter of the truss and adjust the top of the truss in or out to center the bubble in the indicator. Nail a piece of 2-by-4 lumber diagonally from the inside of the rafter to the edge of the top plate, with one nail in each end to hold the truss plumb, or level from top to bottom. Install a hurricane tie bracket in the joint between the top plate and the bottom board of the truss, nailing through each hole in the bracket into the top plate and bottom horizontal of the truss. Install one bracket for each truss to the top plate on each wall. Install the second truss in the same way, 24 inches along the wall from the first truss. Nail a long 2-by-4 to the underside of the rafter on the opposite side of the truss from your diagonal brace so that it extends along the length of the roof, passing through the second truss. Nail it to the bottom of the rafter on the second truss to hold them parallel to each other. Add trusses one at a time in this manner. 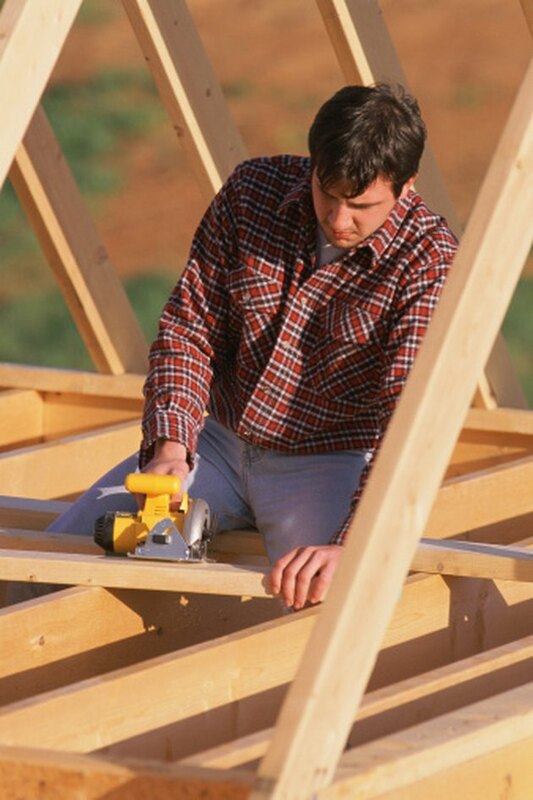 Remove the braces once the decking of the roof is nailed on top of the trusses to hold them solidly in place.